Because the Old Mongols lived in an environment where survival skills were always of the utmost importance, it was a matter of course that they should develop excellent tools, both civilian and military. One piece of equipment that was of great significance in war as well as in the daily life of the Mongols was their composite bow. Perhaps this bow is not quite as well-known in the West as the classical English longbow, which was the best bow ever to emerge in Europe. Yet the Old Mongolian bow was incomparably superior to everything seen in the West. Not until the advent of breach-loading firearms in the 1800's was the Mongolian bow decisively surpassed as a long-range shooting tool. Still the original Mongolian bow remains a formidable tool for targeting, war or hunting, and the people around the Bajkal sea regularly used these bows for hunting at least up to the twentieth century. 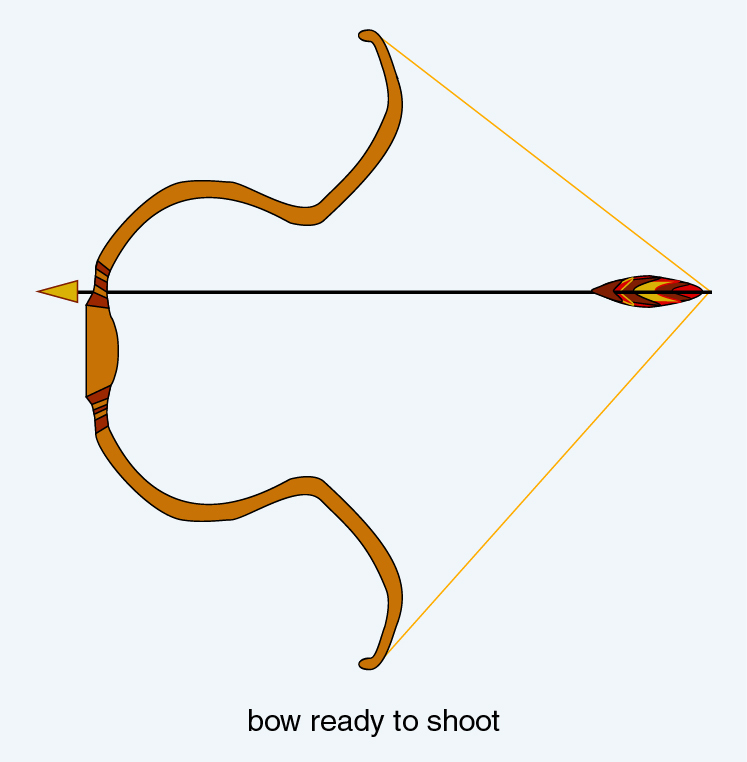 In the following I am going to describe this bow in detail so as to make it clear to the contemporary reader what the Old Mongols could do with their shooting equipment. 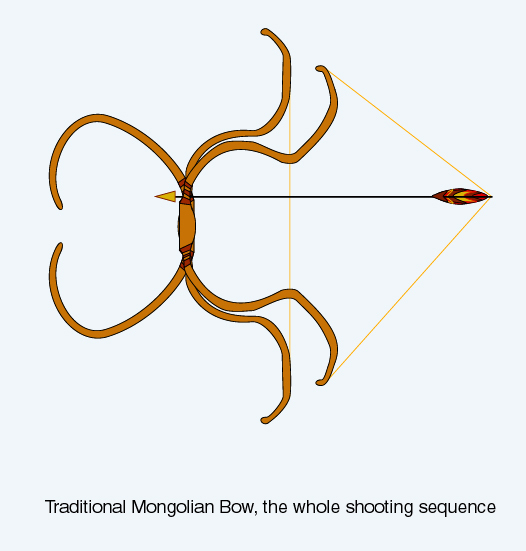 When we are talking about Mongolian bows, the first thoughts go the their military use, although hunting and target practice certainly were more prominent activities. Every day was not filled with war, but hunting and the training of various skills were part of the daily routine. However, we will start with the military aspect. In the military, each soldier carried two bows on horseback. One bow was for long-range shooting, another for shooting at close distances. Also, each soldier had two quivers with arrows for different purposes. To mention but a few of these, there were armor-piercing arrows with a particularly heavy arrowhead of tempered steel, there were incendiary arrows for setting buildings afire and spreading fear in the enemy ranks, as well as whistling arrows for signalling. Of course, the majority of arrows they carried were ordinary arrows where the arrowhead and length of the shaft were adjusted to the normal range at which the particular type arrow was to be used. The standard, according to James Chambers, was that each soldier should have at least sixty arrows with him or her. Yes; it merits mention once more that the strongest and most courageous Mongolian females rode along with the men and fought bravely. Also, the women who did not ordinarily participate in military activity nevertheless had to learn how to wield the bow, a necessary skill for self-defence as well as hunting. We are now going into the details of the Mongolian bow. 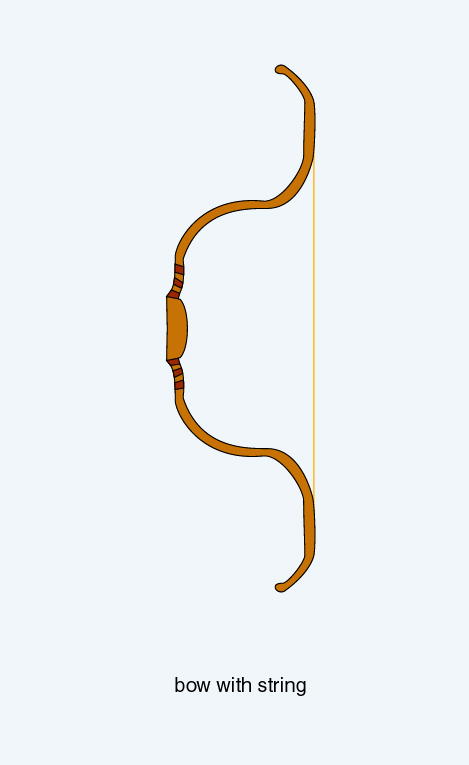 As already mentioned, it was the most capable bow in the world, and probably still is. Even though the modern high-tech compound bows are in some ways more convenient to use and can be made equally powerful, the sheer simplicity of the Mongol composite bow with its complete indepencence of foreign equipment and complicated parts that the archer cannot easily repair or replace makes the Mongol bow on balance a superior solution. In order to show the Mongols and their extraordinary bow the proper respect, the story is mostly told in the present tense, which also serves to emphasize the salient point that these things can be done today as well. The Mongol bow is not as large and long as the English one, but it is vastly more powerful. The draw weight of an English longbow averages around 70-80 pounds, whereas the Old Mongol bow had a pull that, according to George Vernadsky, averaged at around 166 pounds. Chambers states that the pull varied from 100 to 160 pounds. This seeming discrepancy certainly reflects the fact that draw weight varied with the strength of the user, and with what use the bow had been made for. As could be expected, there was a considerable difference in shooting range. Whereas the English longbow could shoot at distances up to 250 yards or around 228 meters, the Mongol counterpart can hit its target at 350 yards or 320 meters and, if the archer is well trained for the task, even beyond that. There are people who claim that the Old Mongols could shoot and hit their target over truly astonishing distances. Gongor Lhagvasuren, Deputy Director at the Mongolian National Institute of Physical Education, has written an article called "The stele of Chinggis Khan." There, Lhagvasuren refers to an ancient inscription on a stone found in the basin of the river Kharkiraa, a left tributary of Urlengui river which flows into the trans-Bajkal river Erdene. The text of the inscription, supposedly dated from 1226, may be interpreted as follows: "While Chinggis Khan was holding an assembly of Mongolian dignitaries, after his conquest of Sartaul (East Turkestan), Esungge shot a target at 335 alds" (536m). Lhagvasuren draws the conclusion in his article that such feats were rather common for Mongolian archers during the 1200's, and writes: "This case illustrates the strength, accuracy and sharpness, physical prowess of the Mongolians who lived more than 700 years ago." Whether or not we find it likely that Mongolian archers could regularly hit their targets at the distances Lhagvasuren claims they could, there is no question that they and their and bows are outstanding in all of archery's history. When we take a closer look at the Mongolian bow, we see that it is an intriguing construction indeed. The backbone of the bow is a wooden frame, which will typically be birch, because that wood is resilient and is also readily available. The total length of the frame is 150-160 cm. 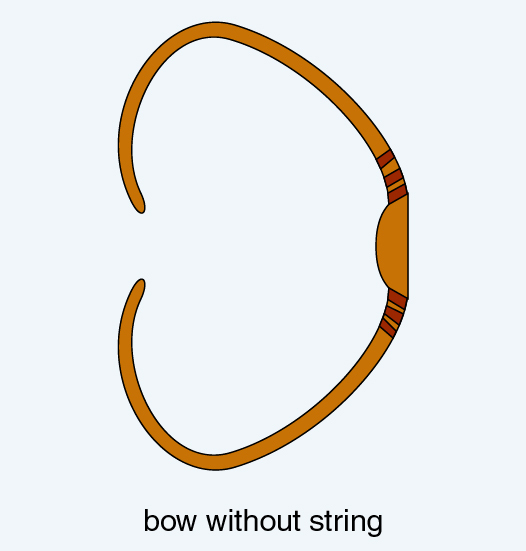 When the bow is unstrung, it looks like a semi-circle with a beautifully curvaceous shape, but when a string is attached the whole thing is stretched out so that its limbs are bent inward. Even so, these limbs with string attachments are bent slightly away from the archer, forming a double curve. It is this double curve that delivers explosive acceleration and awesome velocity to the arrow. From these limbs or bends of the bow behind the string attachments where the impact is greatest, the frame is covered with elongated and flattened pieces of mountain sheep's (or other wild or domesticated ungulate's) horn or/and bone which adds snapping power to the resilient wood in the frame. These hard parts form a layer that covers the whole area of the so-called belly, which is the part between the grip and the limbs. Chambers describes how the back parts of the bow, nearest the archer, were those covered with horn and/or bone while the sinew layer was applied to the outer side. The reader will have noticed that I use the term horn and/or bone. This is because the precise details of how the bows were built could vary over the Siberian area, although the main features are clear. The bone elements, when added, are no more than a small part at the center of the bow, and may originally have served mainly ornamental and possibly magical purposes. 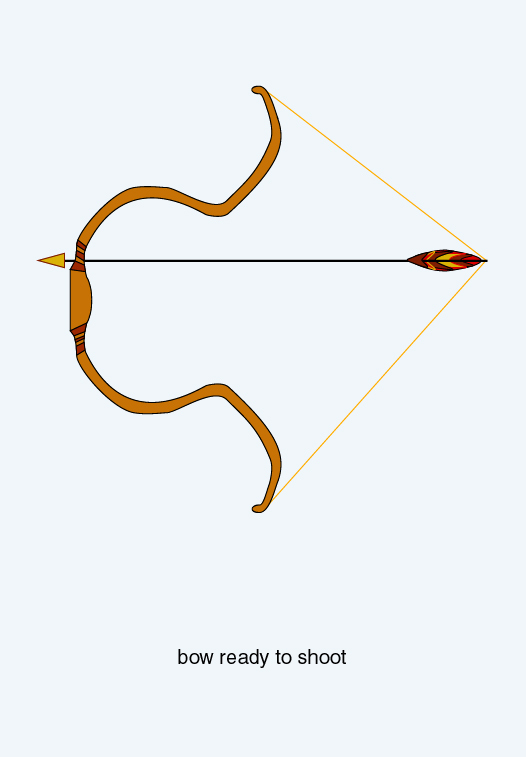 As we understand, a composite bow by definition has several layers. We have mentioned the birch frame, and the layer of horn/bone. In addition to this, there is a layer of specially prepared birch bark whose purpose is to protect against penetration of moisture. In addition to this again is a layer of sinew, which is taken from deer, moose or other game animals. The tendons of domestic animals may also be used, but Mongols feel that tendons from wild animals like deer, moose and mountain sheep are the strongest and best. Naturally, the bow has to be glued together. The preferred and traditional substance used for the impregnation of both leather as well as their bows is fish glue. As a matter of fact, fish glue has been proven through millennia to be highly capable of resisting moisture. Moreover, it is durable and lasts longer than modern epoxy resins, which are prone to molecular fatigue. Above all, fish glue is available in all the waters of Siberia where fish is living, among them the greatest of them all, Lake Bajkal. How is fish glue made? The process that yields the highest quality is to take swim bladders from freshwater fish, soak them into hot water to extract the protein substance, and then boil the resultant soup for a prolonged period. If sufficient quantities of swim bladders cannot be obtained, it is also possible to make hide glue by boiling animal skins. This latter method however results in a glue of inferior quality, because it absorbs moisture, whereas glue made from ichthyic air bladders is highly moisture-resistant. Although all materials needed to build the Mongolian bow are to be found in the immediate natural environment, the whole production process is very complex. It takes a long time to build a bow that is to meet the Old Mongol requirements. We may also assume that the selection of the best wood material for the frame requires knowledge and experience. The usual procedure in the production of a traditional Mongolian bow is as follows: The wooden frame is cured, and the horns and/or bone to be used are boiled for softness. This makes it possible to fit the different parts together with great precision. As we understand, high-quality Mongolian bowmaking is certainly a most impressive craftsmanship. When the wooden frame, and the horns/bone parts are ready, the sinewing can take place. First the tendons have to be dried. After that, they are crushed until they form a mass of loose fibers. Next, this mass is mixed with fish glue to form a solid but not rigid layer. It is important to apply the correct thickness and amount of sinew, and it is done in a two-stage process with some days in between. Too little makes the bow weaker, too much would make it stiff. When completed the layer of sinew could be as thick as a human finger before drying. Sinew has a peculiar quality: Unlike other materials, its strength increases when subject to stretching or impact. This form of elasticity is a property stemming from the molecular structure of the protein of tendons (collagen), and can be seen as another striking demonstration of the innate superiority of natural solutions and materials. When used in a Mongolian composite bow, the effect is that as the horn plates in the front snap back to their former shape, the sinew layer in front contracts in the same split-second, adding further acceleration to the shot as the arrow is propelled forward. At each stage, fish glue has been applied to secure all the parts. In the horns and wooden parts, the sides that are to be glued against each other are first grafted with a toothed special tool in order to give the strongest possible hold. The last step is usually the applying of the protective birch bark layers, which are also boiled until soft, so ensuring a proper fit before glued to the finished bow. When the layer of birch bark has been added to the composite construction, the whole bow is wrapped tightly in ropes and placed in a form where it is allowed to dry and harden in room temperature for one year or more. This ensures that the bow becomes extremely strong and that it keeps its shape and snappiness even after many years of frequent shooting. A Mongolian bow is stored in its own leather case, protecting the bow when not in use. No bow, no matter how powerful, can be shot without a string. Traditional Mongol bowstrings are made from animal hide. First every trace of fat is removed. Thereafter the hide is stretched and twisted. After this treatment it will not stretch, but remain taut. Although the skin of many fur-bearing animals can be used, horse skin is often preferred since it is said that this material maintains suppleness in the exceedingly low winter temperatures of Siberia and Inner Asia. It is also possible to use the intestines of animals as string material, but such strings are not water resistant and thus only suited for use in dry and hot weather. Silk and cotton, and mixes of these, can also be used. Modern archers generally use dacron and other man-made materials that require high technology to produce and therefore cannot possibly be made by the archer himself. Here we see another example that the use of primitive materials, although demanding in terms of individual skills and work, is the more reliable and sustainable strategy when viewed in a broader perspective. When the bow is strung, the archer may sit down, using both feet to press against the bow as the limbs were bent while the string was attached. Using another technique, he or she could also stand upright, bow bent under one leg while the other leg holds the outer end. On horseback, the Mongol archer routinely stringed the bow by placing one end of the bow between the foot and the stirrup while the arms pressed against the bow. The Old Mongols have their own technique for shooting, known as the "Mongolian release." The Mongols, if right-handed, keep their bow in the left hand, pushes it forward as the right arm pulls the string all the way back to behind the ear. The left arm is now fully extended, and the release is near. However, now comes an interesting part. Since this bow has immense power, the Mongols have to use a special technique to hold the string during the drawing of the bow and before the arrow is released. The technique is as follows: The string is held by the thumb, since this is the strongest finger. Still, it is not easy to hold 166 pounds comfortably. Thus, the thumb is supported with the index finger curling around, placed atop the outermost joint, exactly at the base of the nail. The other fingers are also curled, forming a fist. Even so, this is not enough. Hence, the Mongols use a special ring on which the string is hooked before release. This thumb ring, a cylinder that fits around the outer part of the thumb and protects its pad from damage as the string is released, is typically made from Chinese jade or agate, but leather, metal and bone is also known to have been used. Mongolian soldiers used to shoot while sitting on horseback, and with deadly accuracy. This was done by skilfully timing the shots to the moment when the hooves of the horse were in mid-air, so as to avoid disturbing the aim when they hit the ground. Birch is a typical material for arrows too. The normal length of an arrow is between 80 and 100 cm, and the shaft's diameter is around 10 mm. As for fletchings, tail feathers of crane are favored, but tail feathers of all birds are usable. Eagle feathers make a particularly exclusive arrow, but since eagles are rare most arrows obviously cannot have fletchings from eagle's tail feathers. Feathers taken from the wings are said to flow less smoothly through the air, so if given the choice tail feathers are picked. The Mongols characteristically pay close attention to minutest of details. The placement of the fletchings in relation to their size, and what part of the bird they were taken from, is of great importance for correct rotation and good balance in the air. Consequently these factors are painstakingly considered when making arrows after the Old Mongol standard. The arrowheads, or points, could be everything from wide metal blades used for big game (or in war) to bone and wooden points, which are used for hunting birds and small animals. The high impact of this bow ensures that a bony point will be lethal when hitting the body of a smaller animal or a bird. In addition to these kinds of arrows, whistling arrows are useful during hunting, because the effect on animals of an arrow whistling away high above the ground is often to make it stop, curious to see what is in the air. This gives the hunter time to launch a second arrow, this time with a game head to kill the animal. How are these whistling arrows made? They are made by inserting an arrowhead of bone in which air channels have been created. When shot, such arrowheads make a very audible sound through the air. 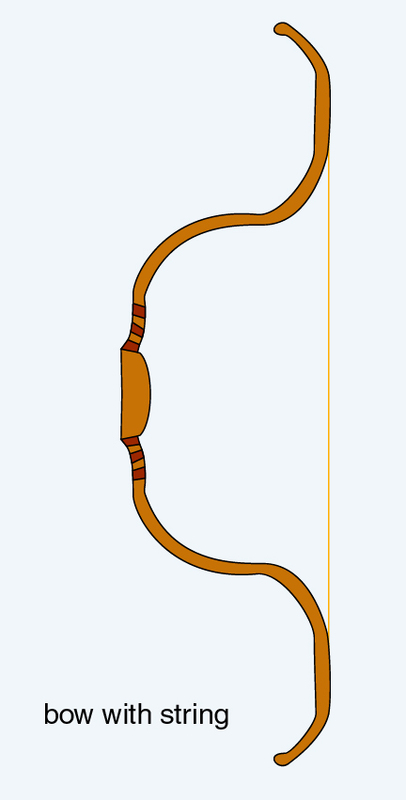 It is fitting to describe the Mongolian bow with images too. Admittedly I have not made these illustrations myself. I had them made for me by Sonja Mari Bunes, who let herself be inspired by the Mongols to create these illustrations. Please pay tribute to Sonja if you download and copy these images and then show them to others. She deserves it for other than legal reasons too, since her inspiring support through many years has been an invaluable encouragement in my work. As a matter of principle I would never, ever, make public anything unless you were not also permitted to copy it to your retrieval and storage systems, but please pay due tribute if anything is made available to others, since the copyright remains with the owner and the artist needs recognition in order to attract people who will pay for ordered works by the same creator. Therefore you are expected to let the full URL of this page, the name of the author (to be found at the bottom of this page) and the name of the artist accompany the material. Commercial use of any of the images is strictly forbidden, and of course you are not permitted to pretend that you are the copyright holder or creator. Apart from this, no other restrictions are imposed on my material. Now a string has been attached to the bow, as you can see. The string is tied to the ends of the limbs, from where it runs over their flat outer ends and keeps the bow straight. Already the string is very tense. Next, we see how the bow has been drawn and is ready to shoot. Note that during shooting, the arrow shaft is resting on the part where the thumb and index fingers meet to grip the handle of the bow. It does not rest on the hand of the archer. Another detail: If the archer is right-handed, the arrows goes to the right of the handle, whereas a left-handed archer will let it rest to the left of the handle. 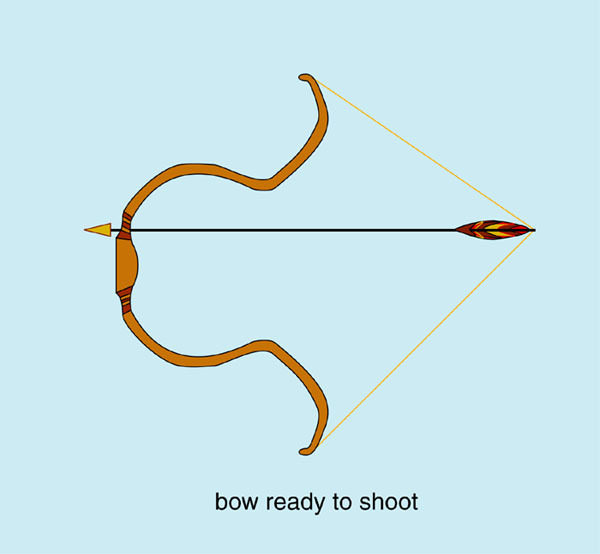 Bow ready to shoot, symbolically shown against a blue "air."